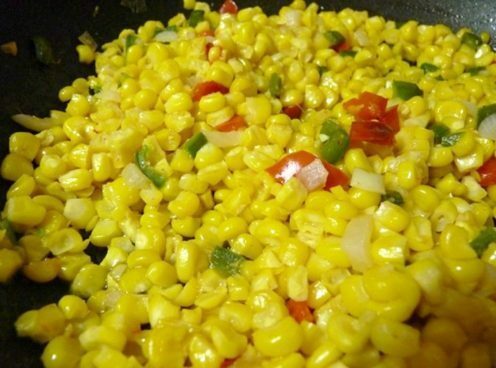 Roasted Brussels Sprouts And Mexican Corn! 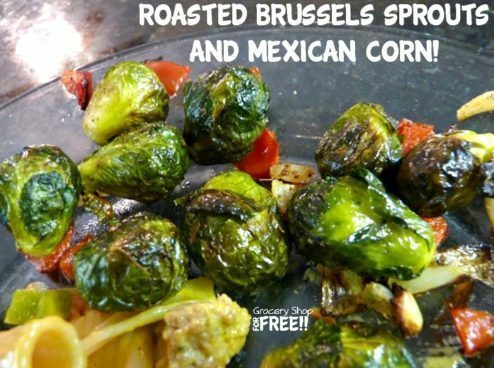 You are here: Home / Recipes / Roasted Brussels Sprouts And Mexican Corn! So, I have to say that I am always taking pictures of my food but I often forget to write down what I put into it. I had the hardest time tonight finding both recipes and photos today. But, I did find some photos of some recent veggies and thought I would share them both. Our family loves vegetables. Don’t get me wrong, we love our meat and we love our carbs but we have to have our veggies. This first recipe is both colorful on the plate and the best way I know to make Brussels sprouts to please even an anti-Brussels sprout person (well maybe). Bring to a boil a pot of water and once it is boiling, drop in the Brussels sprouts and let cook for 5 minutes. Slice the bell pepper lengthwise and the onion in big chops. Cut the garlic cloves into about 3 pieces each. Drain the sprouts and coat in the oil, along with the other vegetables. Sprinkle with salt and pepper. Roast in the oven at 400 degrees for 20 minutes. The roasting takes away the bitterness. Yum! 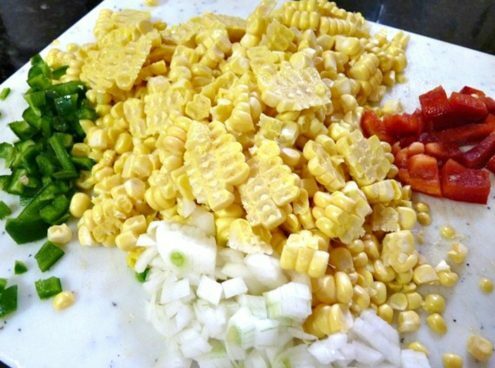 Cut the corn off the ears, chop the vegetables, sprinkle it all with the spices and sauté it in the butter and olive oil for about 6 or 7 minutes (or until the pepper and onions are tender). 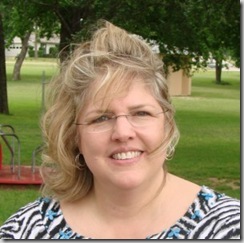 Ok, now that was easy too!